A dazzling interpretation of the La Panthère fragrance, the Eau de Parfum Édition Soir refreshes the iconic gardenia accord and illuminates it with a subtly powdery musk. A radiant, floral accord. Dance through the night! Exuberant and ebullient, this eminently feline black Panther glides to the party's rhythm, veiled in an air of mystery. 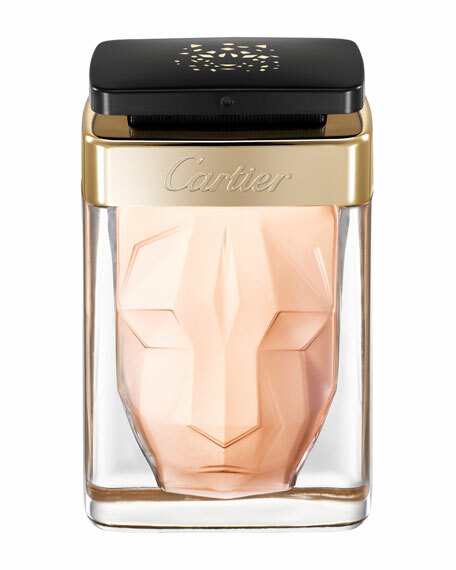 Mathilde Laurent, Cartier's In-House Perfumer, has created a flourished version of her iconic creation, reinventing La Panthère's signature accord of fresh gardenia and velvety musk. Like a divine diva who is the center of attention, the faceted bottle is draped in black with golden glitter, the sign of a woman whose independent spirit seduces and charms.